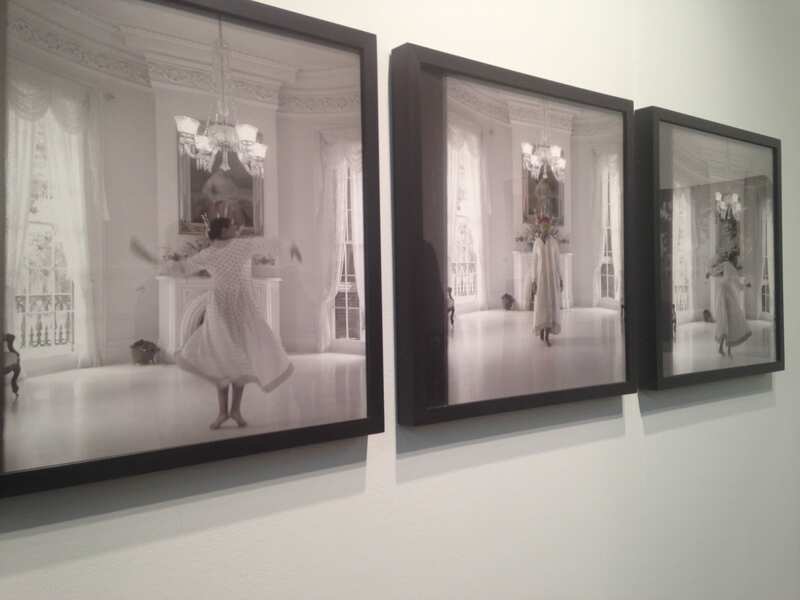 The past few years have seen the influence and quality of The Armory Show experience a steady decline. Whether the fair suffers from a confusing layout, or constantly seeing the same artist with the same works presented by different galleries (what I like to call the “broken record syndrome”), or a mad rush for the VIP lounge only to discover there isn’t even a place to rest your bones (forget any sort of seating to be found in the general exhibition space), it’s a potent reminder of how physically and mentally exhausting an art fair can be. This year’s edition had seem some of the old niggles reappear, but there were several things well worth their aesthetic salt. I’m convinced that this year’s Armory was a testing ground for future fairs under the new stewardship of Noah Horowitz (a PhD. from The Courtauld Institute, experience with The Serpentine Gallery, and authorship of The Art of the Deal: Contemporary Art in a Global Financial Market (2011) is nothing to be scoffed at). Here’s where opportunity knocks: The Armory Focus on the Middle East, North Africa and the Mediterranean (curated by Omar Kholeif with a special commission by Lawrence Abu Hamdan) was not nearly elevated enough to capture the fairgoers’ collective attention: this is an area of opportunity for the fair to flex their creative muscles in future iterations, in terms of a larger curatorial exercise. Sculptural installations and single works were plentiful, but to the point that any traces of photography, painting, video, or sound works seemed marginalized. The emphasis on installation isn’t a bad thing in and of itself, especially when it introduces and communicates seamlessly with other media. There are booths strictly dedicated to painting, some have a single video accessible in digital or projected formats, others are solely sculptural features, and some have all of these elements sprinkled throughout the respective booths. At the Armory, however, the attempt to cram all manner of visual art mediums under one roof proved rather futile. Here’s what did work: Glenn Kaino’s glittering mass of arrows in flight at Honor Fraser’s booth, a demure suite of gelatin silver prints showing Carrie Mae Weems dancing in a nearly transparent white nightgown, Galerie Brandstrup’s laser-focus on young painters (including Michael Kvium and Christer Glein), and Chris Wiley’s quirky photographs mimicking and framed with quotidian substances (never has Astro-Turf served a better purpose than a picture frame) as part of Nicelle Beauchene Gallery’s entry into Armory Presents. Lisson Gallery (London) went installation-crazy with works by Anish Kapoor, Spencer Finch, Julian Opie, and a spectacular maquette for a Dan Graham glass and steel pavilion that will be installed on the roof of the Metropolitan Museum of Art this April. Possibly the most beautiful contemporary painting at the fair was Thomas Schiebitz’s Index (2009-2010), presented by Produzentengalerie Hamburg: a sweeping, bouncy geometric abstraction work that reminds viewers of all the things a little paintbrush can do. The most curious and unusual sculpture of the fair was found at Dublin-based Kerlin Gallery’s booth: a tiny, stunningly lifelike rendering of a crab whose front claws were molded from artist Dorothy Cross’s own index fingers was painted silver, mounted on a small white plinth no more than two feet high (I’m not great with numbers, but as a reference, it’s roughly as tall as my friend’s art-going, Instagram-celebrity French Bulldog named Miss Pickle, if she sits upright). “I’m not crabby…” – Miss Pickle. I mention Miss Pickle not as a random plug, but as a meaningful barometer for the fair, itself. If after less than three hours I’m more attracted to a tiny dog than artworks that cost heart-and-soul to produce, to install, and to buy, then something is amiss. The pup not only provided a welcome rush of endorphins to many of the fairgoers, but she had mesmerized them, completely halting all conversations about pricing, commissions, artist histories, or the like. Make no mistake, Miss Pickle is disarmingly adorable no matter where she goes, but as I observed her interactions with the humans running through the exhibition hall, she began to reflect how seemingly uninterested they were with their large, crazy objects of desire. So that was that. 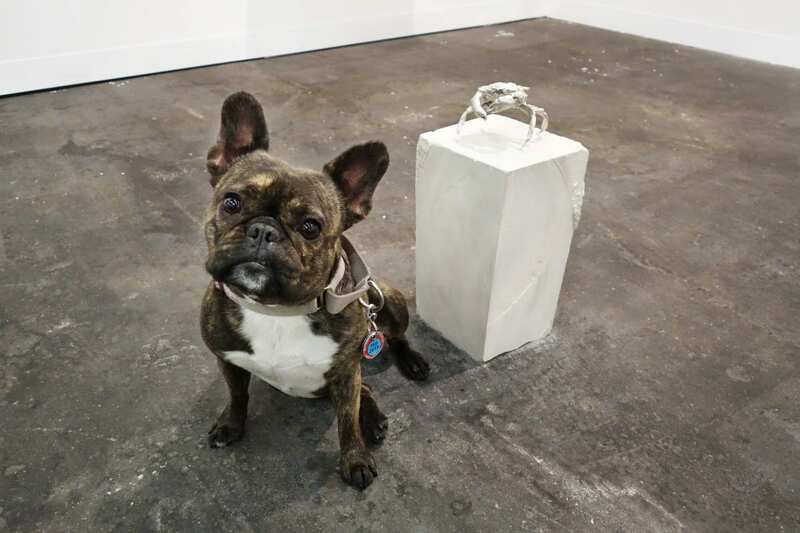 In battle of interest between dog and art fair: Dog 1, The 2015 Armory Show: 0. 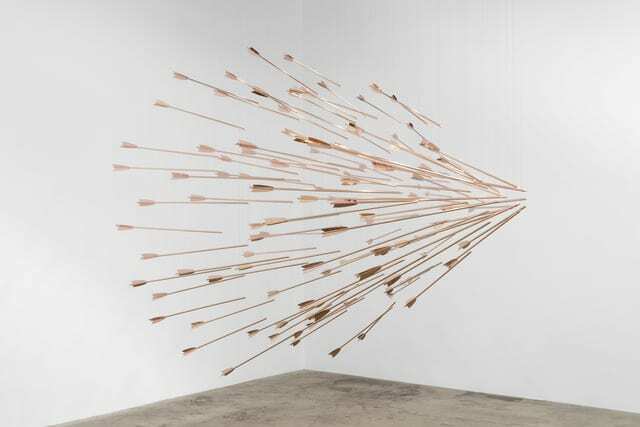 The Armory Show was held at Piers 92 and 94 in Chelsea, New York City from March 4 through March 8, 2015.  Archived in Contemporary, Public and tagged Anish Kapoor, Carrie Mae Weems, Chris Wiley, Christer Glein, Dan Graham, Glenn Kaino, Honor Fraser Gallery, Instagram, Julian Opie, Kerlin Gallery, Lisson Gallery, Michael Kvium, New York City, Nicelle Beauchene Gallery, Noah Horowitz, Omar Kholeif, Spencer Finch, The Armory Week. Bookmark the permalink.